This Christmas, add a touch of sparkle and magic to your home with John Lewis’s biggest and most colourful range of festive decorations to date! 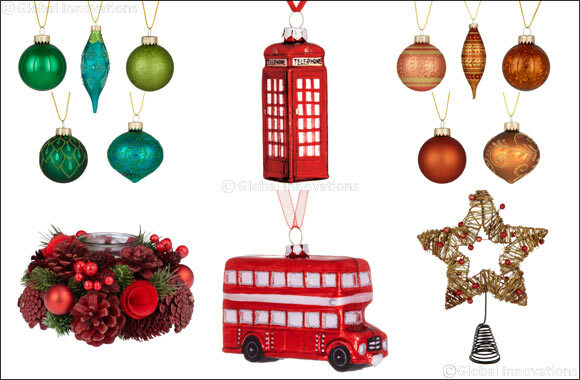 Dubai, UAE, November 21, 2018: Transform your home into a Winter Wonderland and fire up your festive spirit with the new selection of Christmas decorations by John Lewis, available exclusively at Robinsons, Dubai Festival City Mall. The new John Lewis Home Christmas collection will add a touch of luxury and elegance to any home, bringing life to the holiday season. Featuring four festive colour palettes of Amber & Gold, Moonstone, Emerald and Ruby, choose from a selection of beautiful baubles, tinsel, festive wreaths and stunning accessories to create the perfect cosy winter atmosphere at home. From ornaments to stockings, decorative wreaths, garlands, place settings and candle holders, you are sure to find the perfect last touches to your holiday wonderland. The Amber & Gold collection features notes of soft yellow and gold to give your home a Christmas feel full of wildlife motifs and embossed patterns. Complemented by touches of copper, this rustic selection brings luxury and decadence to your home, while maintaining its sophisticated look. The Emerald collection, more inspired by nature, creates a lush and exotic theme with clear glass, feathers and tropical leaves, with animal motifs all working together to create an enchanting wonderland in the woods. Building on the more traditional festive colors of white and silver, the Moonstone collection features a pure finish, with snowy mountains, adding a magical touch to any decor. The Ruby collection adds a touch of color with vibrant velvet shades and rich berry hues for a warm and comfortable theme. However you choose to style your home, the John Lewis Christmas collection will add a unique touch to your living space. The John Lewis Festive range is available exclusively at Robinsons Department Store, 2nd floor (Home department) at Dubai Festival City Mall.